First: I think I have identified the PCV valve and would like to know how to change it. 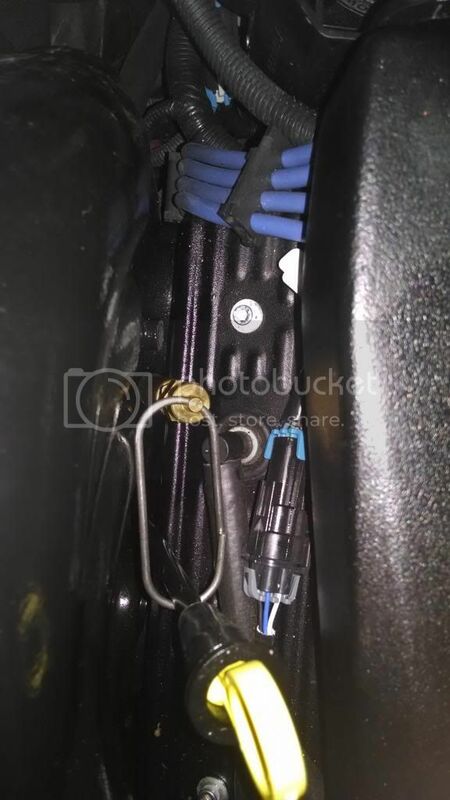 Is it the little 90 degree thing in the picture here beneath the oil drain hose clip? From what I've read... just pull up on the thing and then stick a new one in there. Is it that simple? Any pitfalls/ways to screw this up? Do I really need to be doing this? What is the similar looking hose going into the engine on the other side for? I followed it down and it just ends as an open tube near the flame arrestor. Is this the breather hose? Second question. Cleaning/replacing the flame arrestor. That thing looks pretty stuffed in there and not easy to get at. Any tips for getting it out? Do I really need to be taking this off every year? The PCV is probably $2 at an auto parts store, I'd just replace it. Pick up a K&N recharge kit while you're there for the flame arrestor. Is there a part number for the PCV valve? Bakes lists a straight and 90 degree. (Their 90 picture looks like a 45 to me) His picture above looks like a 90, hard to tell. Are you replacing the PCV valve for maintenance or because there is a problem? I would think on a 2011 it should be fine, is your engine not running properly? My flame arrestor I usually do every other year, every time I take it out to clean it, there really is no dirt or sign of it being clogged. If you think about a car air filter and how many hours the vehicle runs before needing replaced or cleaned, a boat air filter can go quite awhile and how often do you drive your boat in dusty conditions. Just deciding to do my own maintenance going forward. The manual lists the PCV valve and flame arrestor as check points yearly (although also lists spark plus annually which no one seems to do). Sounds like the downside to checking the PCV valve or replacing it yearly is minimal... but the long term downside to a clogged one is significant. The K&N website lists the recommended maintenance free period as something like 50,000 miles + for their filter. Just trying to sort out what I really need abide by in the manual.